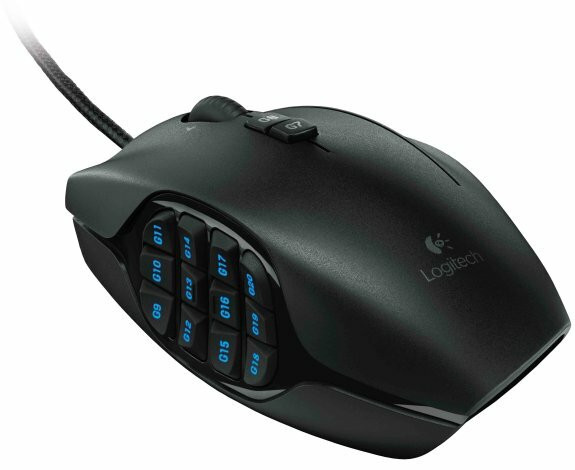 Logitech shows off the G600 MMO gaming mouse, a new highly customizable mouse with 20 buttons. It will ship in July for $79.99. Today Logitech (SIX: LOGN) (NASDAQ: LOGI) introduced the latest addition to its popular G-Series gaming lineup: the Logitech® G600 MMO Gaming Mouse, a highly customizable and easy-to-use mouse specifically designed for massively multiplayer online (MMO) gamers. The mouse features 20 buttons – including 12 thumb buttons, set in two groups of six on a meticulously designed thumb panel – all in easy reach for quick and easy no-look navigation and faster game play. With three default profiles – two for MMOs and one for general gaming – it is set up for optimal use right out of the box, no drivers required. In addition, it has a G-Shift function that easily doubles the number of actions you can perform with any button, giving you complete control in your favorite MMOs. As with all of our G-Series products, the keys are programmable so you can create your own commands, store them in the mouse’s onboard memory, and access them all with one touch. Plus, its sculpted shape comfortably supports your hand through long gaming sessions. For additional personalization, the thumb panel’s RGB illumination is fully customizable with more than 16 million possible color combinations that you can use to easily identify the active on-board profile. The lighting can be set to glow continuously, pulse on and off, continuously cycle, or dim after a user-determined period of inactivity.